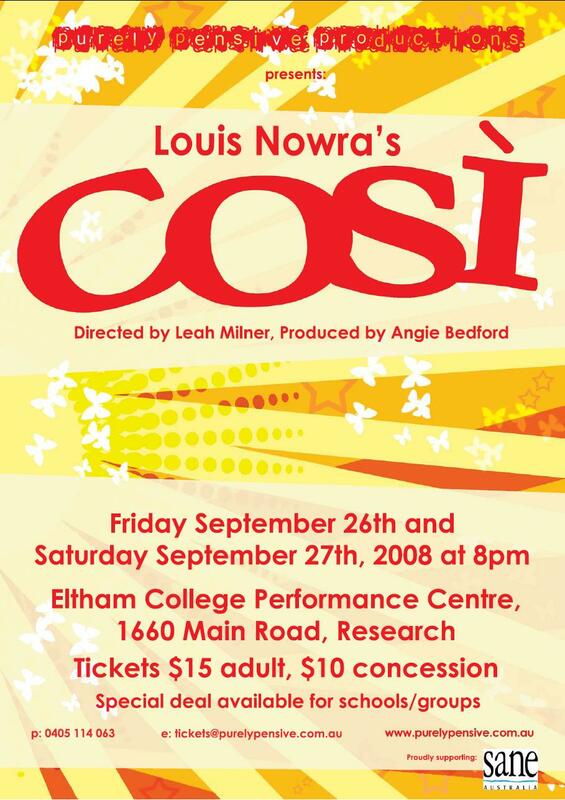 COSI was performed at Eltham College Performance Centre on September 26th and 27th, 2008. Louis Nowra’s COSI tells the story of Lewis, fresh out of University who is employed to help a group of patients at a psychiatric facility to put on a play. Lewis is thrown into the deep end when he meets one of the outspoken patients, Roy, who has decided they will not only put on a play, but an opera of Cosi Fan Tutte with only a piano and spoken in Italian! But don’t judge a book by its cover! As much as Lewis attempts to talk Roy out of it, the production gains momentum as other patients join the rehearsals. This hilarious story shows Lewis grow from an insecure director who has a dysfunctional relationship with his girlfriend Lucy, to an independent man of the world. He makes a promise to the patients of the facility and follows it through. COSI reinforces there is good in the world and that the music of the spheres and laughter are sometimes the best medicine.